The two best Android smartphones, the HTC One (left) and the Samsung Galaxy S4, don't run Google's idealized version of Android. Ironically, most of the best Android phones do not run the best version of Android. Google (GOOG) is quietly starting to change that. 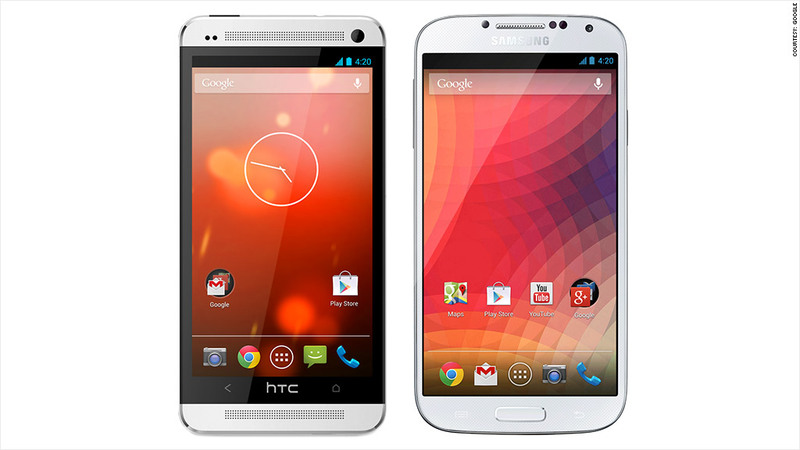 The two best Android phones of 2013 -- the Samsung Galaxy S4 and HTC One -- will soon be available, unlocked and direct from Google, without their respective custom user interfaces. Instead, they'll come with an unaltered version of Android that operates the way Google intended Android to perform. At the Google I/O developers' conference last month, Google began referring to the stock version of Android as the "Nexus Experience." Though Nexus Experience phones will be exclusively available on the Google Play store, they won't be the same as other "Nexus" devices offered by Google. Google designs those phones' hardware in addition to the software. Convincing manufacturers to release Nexus Experience devices is an important step for Google in reclaiming its open-source Android mobile operating system. Over the past few years, the search giant had in many ways lost control. The early iterations of Android were deeply flawed, and phone manufacturers' "OS skins," such as HTC's "Sense" user interface, added some semblance of coherence to the operating system. Realizing that there wasn't much to immediately differentiate one Android device from another, smartphone makers quickly began churning out skins of their own. Along the way, though, Google made significant improvements to Android. In 2010, it earnestly began integrating its core services and technologies into the system's fabric. To overhaul Android's design, Google brought in Mattias Duarte, who played a key role in building Palm's critically acclaimed webOS. It was too late. By the time Google figured out what it wanted Android to look and feel like, the vast majority of devices were running a custom skin. The only significant devices running stock Android were Google's own Nexus phones. Google does not reveal sales figures for its Nexus devices, but aside from the Nexus 7 tablet, current usage statistics seem to indicate that they are far from the most popular Android handsets. That posed a major problem for Google: Every time the company pushed out an Android update, those improvements weren't reaching all those phones with custom UIs. That's a big difference from its rivals. For the most part, when Apple and Microsoft push out an improvement, all iPhone and Windows Phone users get it at the same time. In an increasingly cutthroat market, it doesn't make sense for manufacturers to devote the time and resources necessary to customize updates after they already sold the phone -- much to the annoyance of customers. If manufacturers actually decided to update their devices, they were (and still are, if these usage figures are any indication) frequently a year or two behind the latest version of Android. Today, stock Android is hands-down better than any version of Android with a custom skin. Save for some deficiencies with its camera app, it looks better and performs better. But with the smartphone hardware race dying down and most similarly priced devices essentially indistinguishable from the next, manufacturers are scared to veer away from their lone remaining differentiation point -- the custom user interface -- even if Google's free-to-use experience is superior. That's why the Nexus Experience concept is so crucial for Google. By getting its idealized vision of Android on the most popular devices, Google will be able to push updates to phones at its convenience, complete with its most innovative and competitive features. But it will need to go one step further than its current offering. To make a real impact, Google will need to figure out how to make the Nexus experience available as an update to existing owners of these devices, even if they bought them through a carrier. That's a pie-in-the-sky aspiration. Hardware partners will surely bristle at the idea, since they would largely become an invisible shell for Google's operating system. If Google can accomplish that, however -- even to a degree -- it will be in a much better position to throw down the gauntlet in the smartphone space it is already beginning to run away with.